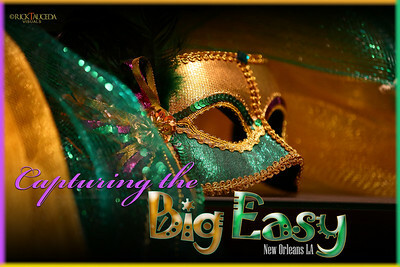 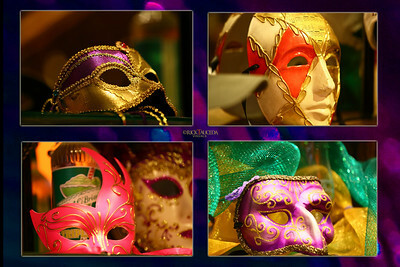 Images from New Orleans during Mardi Gras week. 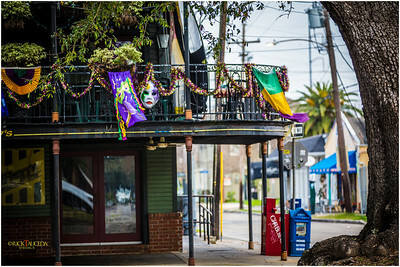 Nawlins, The Crescent City or The Big Easy...photos of a city that parties big during the Mardi Gras season before the season of Lent. 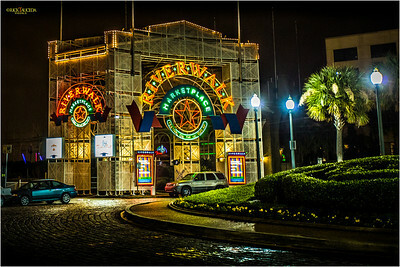 On the eve of Mardi Gras places like the Riverwalk braces for the thousands of visitors arriving for the big celebration. 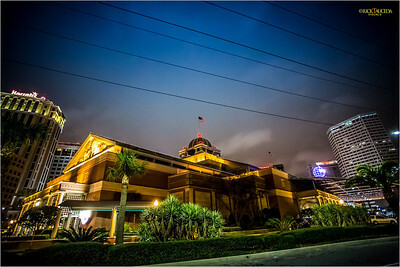 Harrah's Casino at the end of Canal Street. 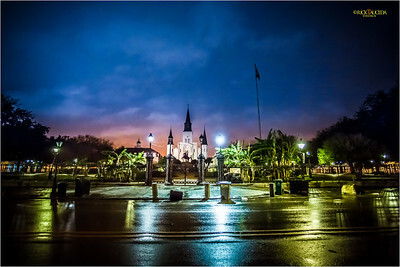 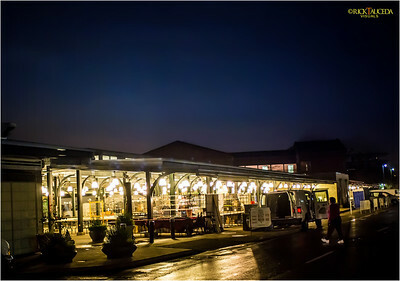 The French Market at the crack of dawn at the edge of the French Quarter. 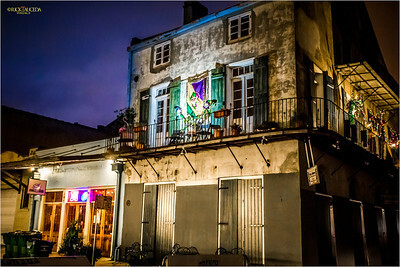 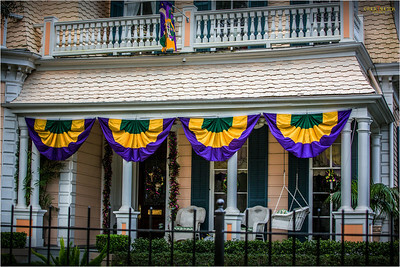 During the Mardi Gras season, homes and businesses decorate their balconies and porches. 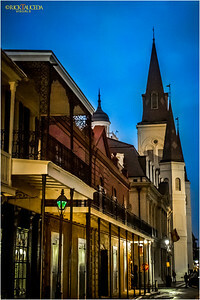 On the corner of Dauphine and Orleans, the shadow of Christ's statute illumines the back of St. Louis Cathedral. 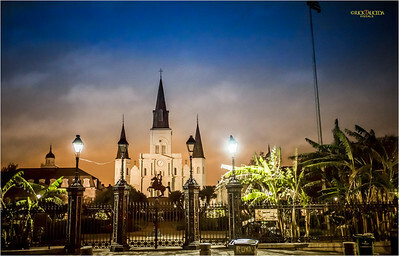 St. Louis Cathedral from Chartres St. 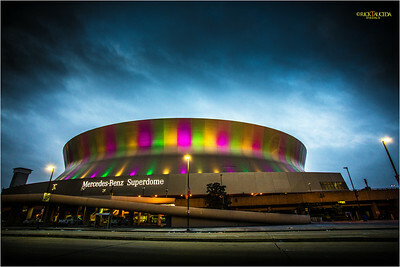 The Mercedes Benz Superdome is arrayed with colored lights in preparation for Mardis Gras. 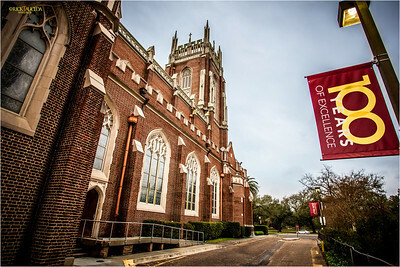 In the uptown section of St. Charles Avenue lies the beautiful Holy Name Cathedral on the campus of Loyola University. 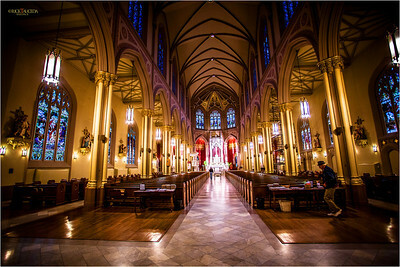 The majestic interior of the Cathedral. 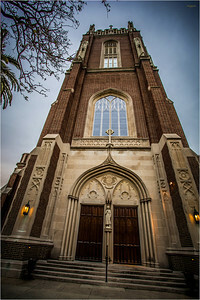 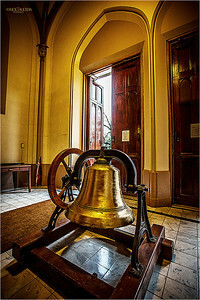 Front foyer of Holy Name Cathedral. 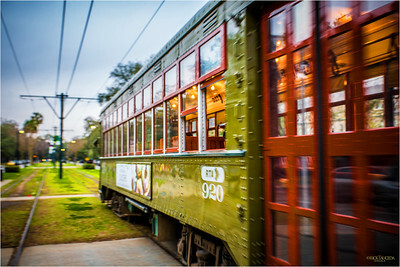 The New Orleans street car or trolley has many stops along St. Charles Avenue. 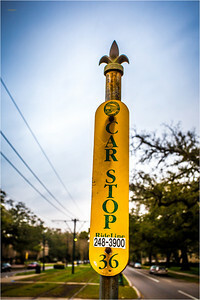 For a buck twenty-five you can ride the street car and see the uptown area in about an hour's ride. 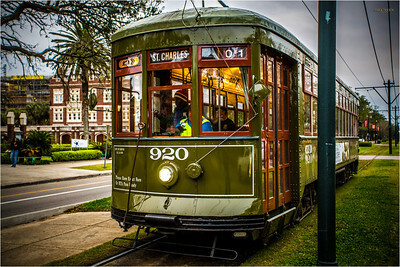 All aboard for a trip into New Orleans' past on the oldest continuously operating streetcar in the world, about 150 years old. 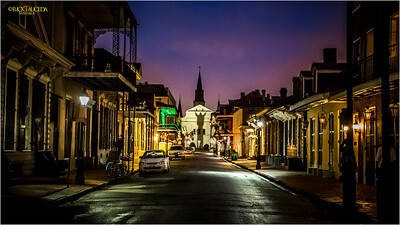 The route traditionally forms a 13.2-mile crescent from Carondelet at Canal Street in the Central Business District through the oldest and most majestic section of uptown New Orleans, around the Riverbend to Carrollton at Claiborne Avenue. 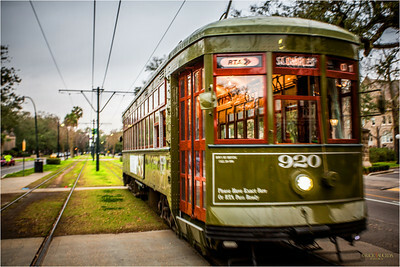 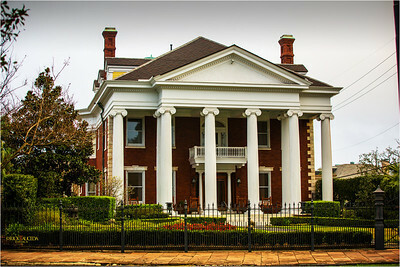 Swaying along St. Charles Avenue through a tunnel of Live Oak trees, the streetcar passes dozens of antebellum mansions, historic monuments, Loyola and Tulane universities. 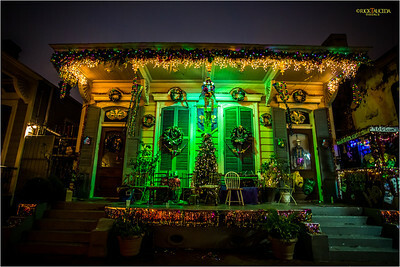 Typical porches adorned with Mardi Gras colors. 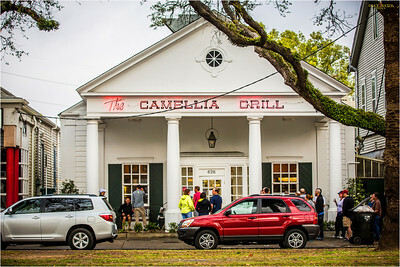 Breakfast at Camelia Grill has a line forming outside its doors...a local tradition. 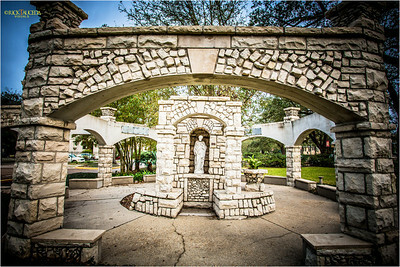 Grotto of St. Joseph in the former St. Mary's Dominican College, now Loyola University property. 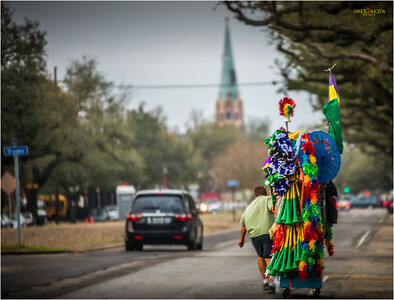 Street vendor on Napoleon Avenue making his way to the start of the Okeanos parade. 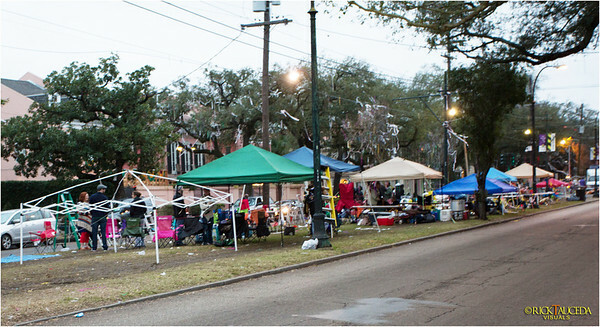 Families stake out their place on the tracks of the St. Charles streetcar line before a parade begins later in the day. 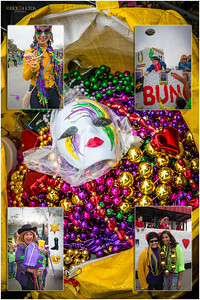 Across the river on the west bank, the Luling parade is in full swing. 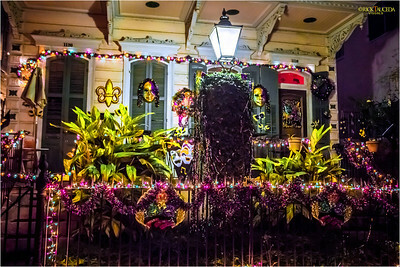 Low budget with humble floats, families enjoy this neighborhood parade. 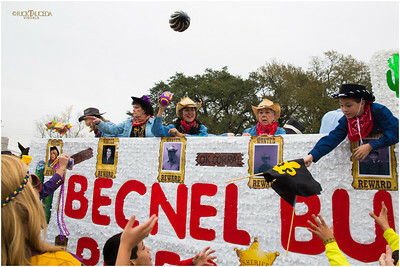 A football up for grabs heads towards my camera lens. 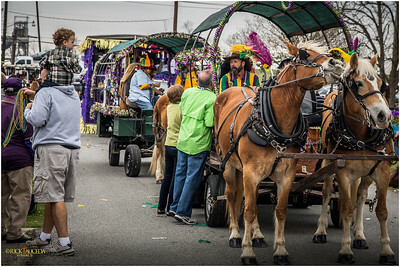 Mardi Gras beads, the ritual of catching and giving them away. 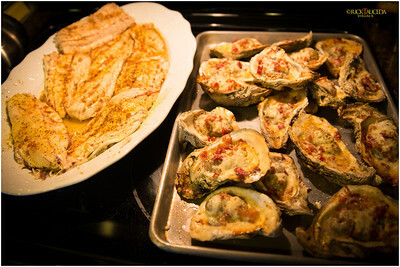 Southern home cooking with fried Redfish and baked oysters on the half shell. 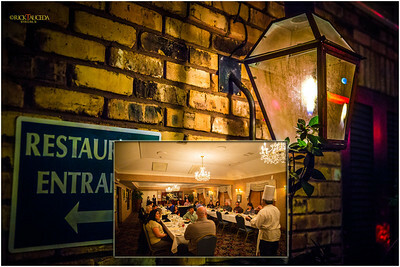 Andrea Apuzzo, Chef-Proprietor of Andrea's Restaurant in Metairie, goes over his dinner menu for the staff of Cajun Fishing Adventures.